Fracking may have been rejected in Lancashire, but the battle reveals that power is being stripped from the people of Britain. On the 25th and 29th June 2015, Lancashire County Councillors decided to refuse permission for two fracking applications by Cuadrilla: in Roseacre Wood and Preston New Road, Little Plumpton. This follows a long campaign and a lot of arduous work by numerous local residents' groups, environmental organisations as well as campaigns such as Frack Free Lancashire, among others. Outside the county chamber, the announcement of the votes is greeted by loud cheering that is soon eclipsed by tears of joy and friendly hugs. The outcome is an unprecedented victory for the local residents and their self-organising as well as the local democratic process that involves parish, borough and country councils. It also comes as a definite blow to the national government's stated interest in “going all out for shale” in the UK. Given this controversial priority, I look at how democracy has fared in the country since it declared that around 60% of its land would be available for fracking companies to licence. In late June 2015, the Development Control Committee at Lancashire County Council, who determined the decisions, were under a lot of pressure because the legal advice provided to the Councillors seemed to leave them no choice but to approve the application for Preston New Road (PNR) lest the Council and the people of Lancashire foot the bill when Cuadrilla appeal the decision. Ultimately, an alternative legal opinion was sought and provided to the Councillors and, after a unanimous vote to refuse permission to frack at Roseacre Wood a few days earlier, the Councillors felt there were also sufficient grounds to reject the PNR application. The results of the votes clearly diverge from the recurrently short-sighted policy-making and technocratic narratives that characterise much of the global and national discussion about the future of resource extraction and energy production. The Council did not cave in to financial pressures and the discourse that portrays fracking as a matter of an overriding national interest. The process, however, has also made something else plain clear; it confirmed that the agenda of resource extraction, energy production and their impact on climate change cannot be surrendered entirely to political representatives and industry. What is missing in their approach is a true and sustained commitment to an open dialogue about the systemic issues surrounding the future of energy as well as the future of democracy. The worrying trend is that even at the level of the county council – where the planning process comes into contact with local representative democracy(i) – the grounds for refusing permission for fracking are thoroughly disappointing from a democratic point of view. The permission to frack in PNR was refused on the grounds of noise and visual impact. The application for fracking in Roseacre Wood was rejected because of the potentially severe impact of the planned development on the road networks. The permissions were refused not because of the adverse impact of fracking on human health or climate change or the fact that there were thousands of objection letters and many more petition signatures that were submitted in relation to the two applications. (ii) It is obvious that the focus of the planning system should be on the considerations about what constitutes an acceptable use of land so I do not argue that the Development Control Committee should have a responsibility to take into account all kinds of possible objections to fracking. I do argue, however, that outside of the Committee, there is insufficient room for citizens to exercise their democratic right to make decisions about what sort of development they would like to have in their locality and which energy sources offer best chances for ensuring a better common future. What happened in Lancashire is not an exception but a symptom of an increasingly problematic relation between state, fracking and democracy, understood not solely as a rule of periodically elected representatives but as an ability of people to govern themselves and make direct decisions about their communities. The positive outcome in Lancashire is undoubtedly a result of the local residents' perseverance in mastering the welter of legal regulations and precedents which they skilfully utilised to make and defend their case. They also raised a host of other relevant topics that should be a matter for democratic debate such as issues of climate justice and the influence of corporate interests on politics. None of these concerns, however, could be brought to bear on the Committee's decisions. In effect, fracking in Lancashire (and the UK) may be and has been framed and viewed as a problem of and for planning systems. Rarely is it debated as something that has real consequences for people, communities and democracy. Meanwhile, fracking has been at least temporarily banned in states such as France, Germany, Bulgaria or the New York State where some democratic discussion about it has taken place. In the UK, on the other hand, many see the fracking objective to be the driving force behind the rewriting of some of the most important laws. Below I am listing a few examples of the scope of controversial pressures and recent changes to the legislation. I am paying particular attention to those of its provisions that appear to be designed in ways that help evade different forms of popular democratic contestation and reinforce persistent inequalities between various stakeholders. Localism Act, 2011. The Localism Act was supposed to devolve some powers from the central government levels to local representative bodies. It introduced a new requirement for developers to consult local communities in the pre-planning stage – before they submit their applications. As part of their engagement with the community, Cuadrilla has also established a special community liaison group in Roseacre where representatives of the company, their consulting engineers and local residents have met fairly regularly. Necessarily however, the meetings did not offer room for debating whether or not the development should take place but were overwhelmed by discussions about technical parameters, measurements and designs, where experts' role was to reassure the residents about the safety of the development or advise on the appropriate mitigation measures. Quite paradoxically given its name, the Localism Act has also given government ministers responsibility for making decisions about nationally significant infrastructure projects (NSIPs). When a development gains the status of the NSIP, it can move ahead even without local consent. The government has already added the highly controversial nuclear waste storage facilities to the list of NSIPs so it is clear why many are afraid that fracking might become the next NSIP. There is also another, less apparent, side to the status of an NSIP. International experience with strategic oil pipelines, for example, shows that all projects that are declared to be in the national interest of a state tend to be heavily policed and their “defence” against real or perceived threats becomes securitised. A very early foretaste of what this might entail could be seen even during the protests in front of County Hall in Preston. In addition to the usual police presence, the colourful and peaceful gathering of local residents was policed with the help of Metropolitan police, at least three vans of the operational support unit and a private security company with multistage security checks inside the County Hall. Transparency of Lobbying, Non-party Campaigning and Trade Union Administration Act, 2014. The Act had been dubbed the “gagging law” as it places substantial burdens on the ability of NGOs, charities and other organisations to campaign on issues of legitimate concern during an election period. In contrast, there is no parallel restriction that would apply to lobbyists representing vested corporate interests. Cuadrilla's consultant lobbyist – Hannover Communications International Ltd.iii which boasts about its unconventional oil and gas portfolio to span from Shell and Valero to Cuadrilla and Tamboran Resources – is, therefore, let off the hook to lobby whenever it sees fit. Anti-Social Behaviour, Crime and Policing Act, 2014. The Act introduced new dispersal powers where a police inspector may issue an authorisation to disperse for a period of up to 48 hours with an immediate effect, replacing an earlier requirement to consult with a local council to designate a dispersal zone in advance. This may have a potential impact on the policing of protest in the UK. George Osborne's letter dated 24 September 2014 (revealed January 2015). The Chancellor sent a letter to his cabinet colleagues (Committee on Economic Affairs) urging them to fast-track fracking, making the rapid progress on the issue their personal priority as well as responding to some requests from Cuadrilla. The letter also shows government's commitment to full exploration and plans to centralise regulation by moving to a single national regulator once production is under way. Infrastructure Act, 2015. The Act introduces a political definition of fracking as a process that involves more than 1,000 cubic meters of fluid per stage or more than 10,000 cubic meters of fluid in total. These quantities are less than what was used in the fracked well at Preese Hall, Lancashire and less than what has been used in some wells in the United States. If the law had been enacted before the operation at Preese Halliv began, legally speaking, it would not constitute fracking. The Act also changes trespass laws for underground drilling access. It grants drilling companies automatic access rights to use deep-level land (below 300m) in any way for the purposes of exploiting petroleum, including passing through, putting in and keeping any substance in deep-level land. Since fracking uses horizontal drilling, this means that companies can drill under anybody's land without their permission or compensation. The Department of Energy and Climate Change played down objections to the proposal raised during the consultation stage as mainly campaign texts and moved ahead despite popular opposition. Finally, the Act forces the government to assume the economic objective of drilling corporations as its own national objective since the law obligates all future governments to maximise the economic recovery of UK petroleum (and hence, oil and gas extraction). This is at odds with the UK's climate change legislation as well as its international commitments to become a low carbon economy. Environment Agency opens a Standard Rules Consultation, March 2015. New standard rules, generic risk assessment and waste management plan are proposed for onshore oil and gas activities at exploratory wells. The stated aims of the proposal are to generate a positive financial impact on business as well as saving time and money. Department of Environment, Food and Rural Affairs report on fracking, July 2015. After a Freedom-of-Information request, an un-redacted version of the report on the impact of fracking on rural economy is revealed. The covering note appended to the report states that it is a draft literature review for internal use only and that it is based on assumptions that are not supported by appropriate evidence. The full report, however, demonstrates that the previous, heavily redacted, version left out significant chunks about potentially negative impacts of fracking – in the name of not letting early thinking close down discussion. The above list looks rather pessimistic when it comes to the prospects of ensuring that debate about fracking is a level playing field for everybody. More democratic debate and decision-making, however, is crucial if we care about the human dimensions of fracking that are currently being obscured in planning jargon and discourses. If democracy (not only locally and nationally but also internationally) is about putting the interest in real effects on vulnerable populations on the front burner, then we need to talk openly about the consequences that the dash for unconventional gas has had and is likely to have on democracy. A gradual taking away of citizens' rights in times of intensified popular mobilisation is not a new phenomenon; it is well-known to students and researchers of social movements. The pace of this process in the UK, however, has been staggering. 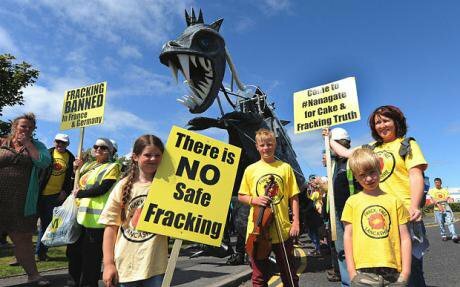 Legislation that rules much of the fracking activity has been passed over a period of just two years and many potential challenges associated with anti-fracking campaigning, protest, trespass litigation etc. have been removed, bolstering industry confidence in the eventual success of their ventures. As a result, the persistent gap between citizens' rights on the one hand and industry and state resources on the other, has widened even further. Moreover, the local resident groups in Lancashire have been boxed in by the planning system and national narratives that have redefined what constitutes a reasonable concern and a relevant objection to fracking. With no room for a robust democratic debate about fracking, the planning procedure carefully selects which objections are valid and which are not. Citizens' attempts to gain an authoritative voice on the social impact of fracking run up against a wall of technical regulations and undue pressures from politicians. To be sure, this is not an exclusively British problem. Global climate change is also seen as a technology or economic problem that can be solved by geoengineering and appropriate trade systems. Climate change is not necessarily automatically seen as an environmental or social justice issue and its human side is largely secondary. As the protesters in Lancashire chanted, however, frack free Lancashire does not mean much without a frack free planet. This does raise important moral and democratic questions about vulnerability, inequality and best models of democracy. The potential consequences of fracking go beyond road destruction, noise pollution and change in landscape; they extend beyond Lancashire. The impacts of climate change tend to be distributed unequally across different regions and different parts of the population. And it is the protesters that are bringing all of these aspects of fracking to the forefront by challenging embedded assumptions and asking tough questions about responsibility and the necessary scales for meaningful action. What lessons can be drawn from the anti-fracking struggle in Lancashire? It is clear that with great courage and perseverance, it is still possible to challenge the system and win even when one is playing by its rules. It is important to be able to do that because it ultimately achieves what it is supposed to achieve – at least for the time being. As the above overview of the recent legislation shows, however, rules can be changed quite quickly, after scant democratic debate and with little regard for public opposition. Are there then any vulnerabilities of this system that local groups could use to their advantage when they are striving to live with clean water, air and land not as luxurious commodities but as part of a healthy and equal planet? They can definitely set up their own democratically-run renewable energy initiatives. In addition to providing clean energy, this would also insert the issues of democracy and responsibility for climate change into the national and local discourses as well as producing positive global effects. Instead of letting fracking and state policies fracture it, local communities can play a vital role in repowering democracy in and beyond the UK. iBefore the applications at Roseacre and PNR, Cuadrilla applied for planning permissions at seven other locations in Lancashire. Five of them (decided between 2009 and 2011) never went to a relevant committee. Instead they were decided by a delegated chief officer. iiiThe company works also for such clients as: Goldman Sachs, Allianz, Microsoft, Sky plc as well as several pharmaceutical concerns. ivIn 2011, Cuadrilla's activities at Preese Hall triggered two tremors and put a temporary halt to fracking in the UK.